Building SHED has been a great experience on many levels, especially when it comes to the amazing people we meet along the way. In this post, combined with the unveiling of one of our favorite parts of our project, I would like to shine a little spotlight on a good friend of ours that has been very important to this project. His name is Nate and he is the owner of the quickly growing business, Atlas & Cedar that is poised to take the furniture and architectural detail fabrication world of the PNW by storm. I met Nate at a Halloween party a couple years back when he was an estimator at a now defunct metal fabricator here in Yakima before I, and maybe even he, knew of his future potential. Nate was genuinely excited that I had a design background and the majority of my time at that party was spent conversing with him about his time renovating houses in the Seattle, living in a tent on the Puget Sound and making his way to South America without a return date. We shared an affinity and appreciation for making, and not only for the beauty of the resultant object but for the challenge of the process. I like Nate because we can nerd out over architectural details on beer soaked napkins and he ends up educating and inspiring you in the same conversation. The people Nate does business with like him because he makes them look good, really good. Architects have a lot going on when they design a building, and one of the first things that starts to lack can be their execution of details. A vague idea from a client only becomes marginally more understandable in the form of a rough “detail” drawing with a few dimensions and a shot in the dark material specification before it makes its way to Nate’s desk, which I might add is inside a retrofitted shipping container! Nate needed an office that wasnt inside his shop so that working on the computer and taking phone calls were not burdened by the loud noises of saws and fabrication. So he baught s hipping container and is currently renovating it into a slick office. Putting windows into the shipping container office project. The facade of Nate’s ongoing office project. Nate could run a successful business centered around just furniture design & construction, just metal architectural detail fabrication or just professional wood and metal finishing work if he wanted, but luckily for us (and I mean everyone that works with him) he combines all three expertise with an excitement for problem solving and an interest in quality design to bring any idea to reality. Seriously, Nate’s name is the one that comes up when “no one else can do it,” and his years of working with local material suppliers means he not only knows what and how, but where to get the necessary and highest quality materials. I could go on and on about the depth of Nate’s passion for quality and the precision of his attention to detail but his work speaks for itself and I can’t wait to see his craft unfold in the future and these stairs we are about to show you would not have been possible with out him. 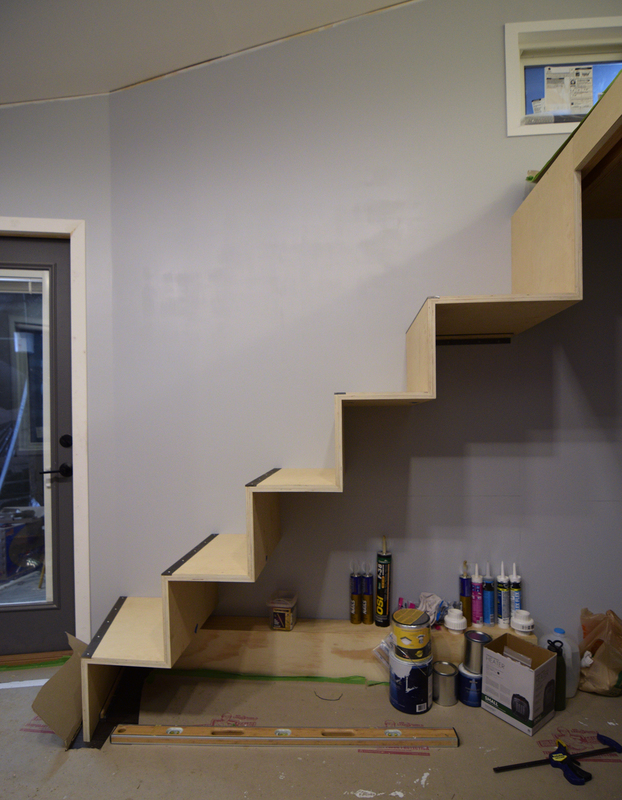 Our interior stairs started as a couple sheets of 1/2″ birch plywood. We then cut them down close to the size of the treads and risers, making sure to leave enough extra to trim the sides and cut a mitered edge into each end after the were laminated together to make 1″ thick pieces of plywood. The treads and risers are 12″ long/tall by 22″ wide. Once it was time to start gluing the treads to the risers, Nate, introduced me to the Festool domino joiner which is a tool that replaces my previous experience with a biscuit joiner. The domino joiner uses a special drill bit that spins and oscilates side to side to carve a unique hole that looks similar to an oval. these holes a precisely located on both sides of your miter joint and then the domino, which is this systems replacement for the biscuit, is glued and inserted into the hole with its other end doing the same on the corresponding miter before the joint is push tight and clamped to complete the joint. The benefits of the domino over the biscuit is a stronger joint and a higher level of precision because as long as you are accurate with your hole placement, the joint simply aligns itself perfectly once the dominos are inserted where as there is more slip tolerance when constructing a joint with biscuits. Once we had all 5 of the leading corner miters constructed we cut out a notch in the toe of the stair to allow for the addition of a steel flat bar inlay to protect the toe kick corners from the inevitable abuse they will have to endure. After the notches were cut we continued to glue each stair to the next until the stair was one single piece that was transported to the site and installed in place, using angle iron brackets to fasten the stair to previously installed wall blocking inside the wall. The next step will be to build storage underneath the stairs as this will help to support them and will be our clothes storage. 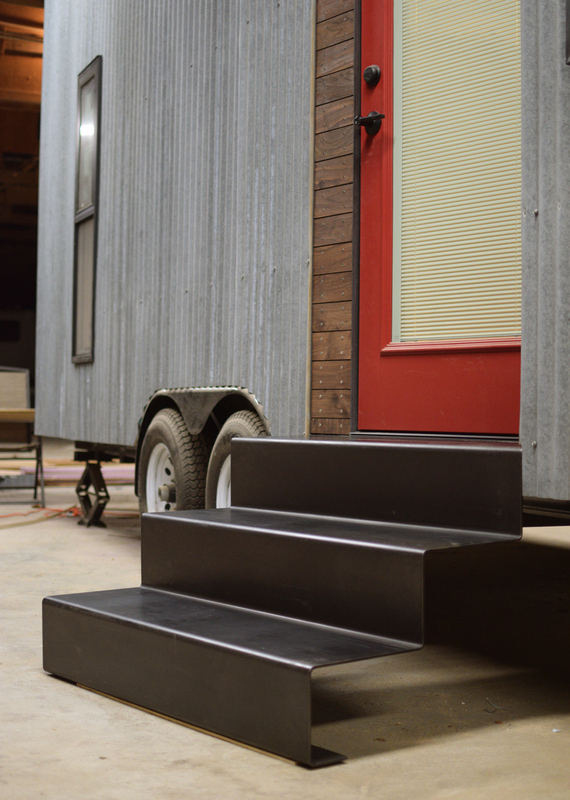 Our exterior stairs are simple; One 44″ wide plate of hot rolled 1/4″ steel, literally folded into a set of custom stairs leading up to our front door. Taking that line I drew on the computer and making it this beautiful reality is a little less simple, but like I said, Nate specializes in making an idea a reality. Looking TERRIFIC as is everthing else you people have done. PROUD of you all!